Nick Price and Tom Fazio II to redesign public golf course in Florida. According to the Palm Beach Post, the design team of Major Champion Nick Price and Tom Fazio II have been awarded the contract to redesign the closed Ocean Breeze Golf Club in southeast Florida. Occupying a 214-acre site one mile from the ocean, the Ocean Breeze golf course was purchased in 2017 by the Greater Boca Raton Beach and Park District for $24 million. The Park District operates several city parks and chose Price and Fazio II to redesign the golf course, with plans to reopen it as a public facility known as the Boca Raton National Golf Club. When the course does reopen, it will provide public course golfers in the area with their only 18-hole facility as a nearby municipal course was recently sold by the city to a developer. Boca Raton National is surrounded by condominiums and split both north-south and east-west by roads. The budget for course works was not was mentioned in the article, but is likely to be substantial given the Park District aims to convert the site into a destination golf course. Nick Price is well known in golfing circles as the winner of three Major Championships, while Fazio II is the nephew of celebrated golf architect Tom Fazio and previously worked with Price on the nearby McArthur Golf Club. The pair apparently beat 14 firms for the design job, including other Florida based celebrity designers such as Greg Norman and Nicklaus Design. BOCA RATON — Professional golfer Nick Price and well-known golf architect Tom Fazio II will design a highly-anticipated public golf course that the city’s park district bought less than a year ago. 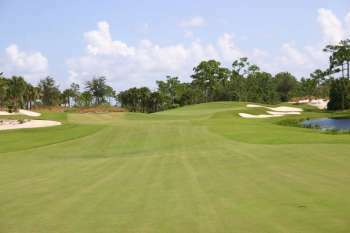 Price and Fazio have partnered on the golf course designs in the past, including on MacArthur Golf Club in Hobe Sound. Now that the park district selected a firm to design the course, pending contract negotiations, the district will gather feedback from residents to help shape the final course design. Price and Fazio suggested a driving range and 9-hole short course on the east side of the golf club, divided by Northwest Second Avenue. The west side would have an 18-hole course. Those ideas could change during the design process. Fazio assured the park district that his team could get the golf course designed and built in a short time-frame. The park district aims to open Boca Raton National Golf Club around the time Boca Raton Municipal Golf Course, on Glades Road west of Florida’s Turnpike, is expected to close, as the city sold the land to a home builder. Boca National Golf Club will be one of just two public courses in the city. The other is a smaller 9-hole oceanfront course at Red Reef Park.